"A world class heron Sculpture edition." Heron sculpture design is a little nicer in person! Contact us for early-issue price savings!! width 24 × depth 17 × 38 inches, Fully lifesized and free-standing over 3 feet tall! 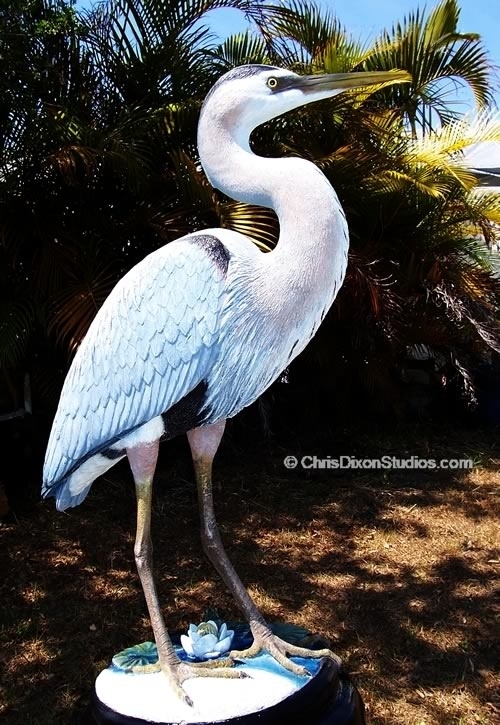 A Super realistic true to life size Great Blue Heron wildlife art sculpture, limited edition. Heron birds are also available custom painted as the lifesize White Heron, Great egret waterbirds, with specialty custom finishes [bronzed, black onyx, Zinc white..]. Our heron is cast by hand of fiber reinforced durable epoxy resin that can be pigmented various colors. Those free-standing bird legs each have ½ inch steel rods bonded with high strength epoxy resin. It is strong enough to even support itself as a half sided pair of herons set for a wall sculpture arrangement! This is as quality engineered as it is beautiful. This heron or crane sculpture is standing with one foot on the foot-printed pond beach with the other bird foot at the water's edge. Three lilly pads float a frog and an elegant lilly flower. The herons base is an elegant footed and turned look that emulates the S-neck of a heron, crane or egret. This shorebird is suitable for interior or exterior use in the porch or garden; with the wildlife! Makes a great foyer greeting sculpture. Folks are saying we have outdone our lifesize pelicans with this one! Truly an amazing heron wildlife bird artist sculpture at any price. State of the art cast 'Poxy-porcelain�', a unique proprietary compound of high strength, durable and nontoxic artists' materials. Great Blue Heron species info facts will be added here!. Other herons, see also: "Blue Crane", Great White Heron, Wurdimans, American egret. Heron symbolism: "..appearance of a heron is a good omen ..herons are sacred to the Greek sea-god Poseidon as an emblem of Atlantis ..the Greek goddess of wisdom, Athena, used a heron as a divine messenger ..China and Japan symbol of the yin-yang may be a heron and crow pictured together ..by standing on one leg, herons like cranes, earned a reputation for contemplation, vigilance, wisdom and inner peace ..herons depicted with a white stone in the beak are images of discretion, and the wisdom obtained through the Christian practice of silence ..Native American legends are of deceased wise men ancestors who visit the earth within the heron's body. "